A cluster of rich male collectors are creating vast sculpture parks in various parts of the world-and proving to be exacting patrons. On the Mornington Peninsula south of Melbourne, sculptures by Clement Meadmore, Geoffrey Bartlett and Anthony Pryor are springing up across the landscape. 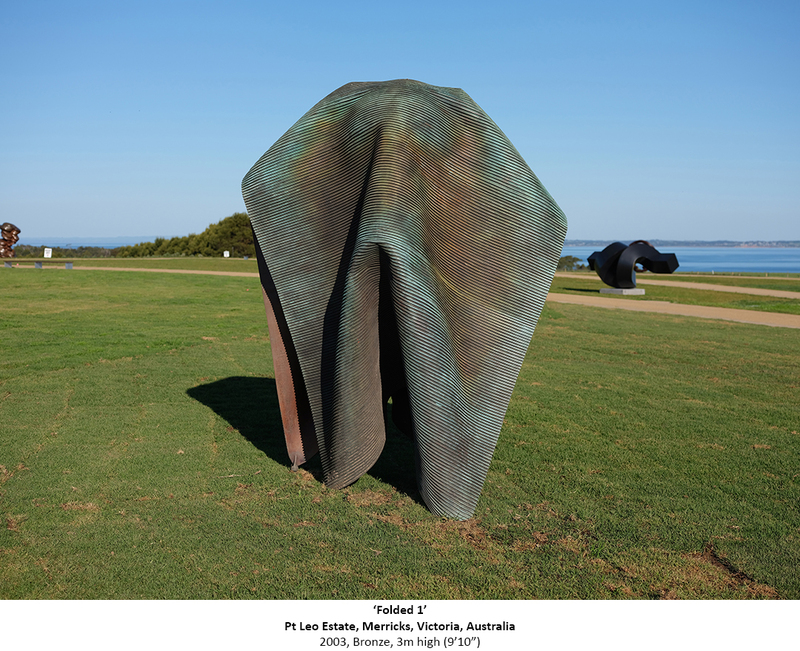 Works by the Australian artists are among 45 pieces dotted around a 135-hectare seafront property owned by the retail billionaire John Gandel. 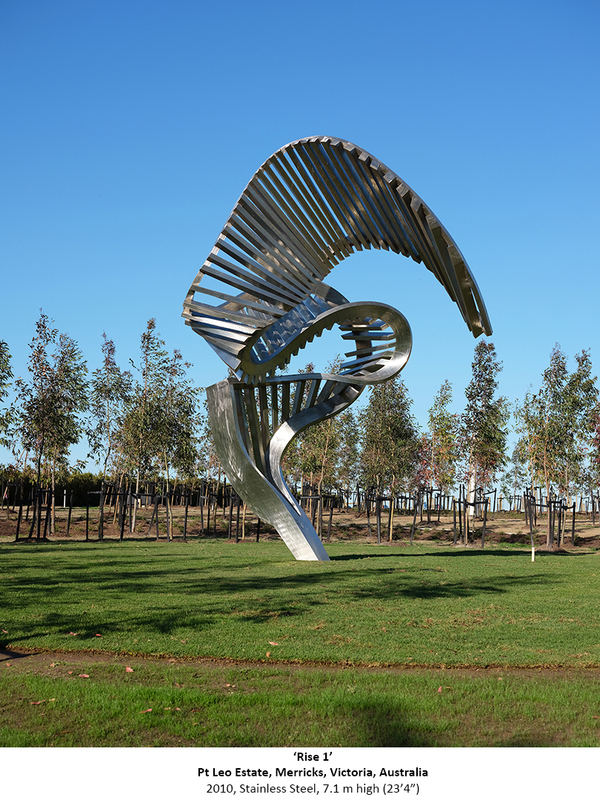 A winery and restaurant form part of the complex – but the main attraction is the Point Leo Estate sculpture park, which is due to open later this year. Gandel is joining an exclusive club: patrons who set up sprawling sculpture parks in a bid to make their mark on the art scene. The New Zealand-born magnate Alan Gibbs has built a gargantuan but relatively undiscovered contemporary art park. Gibbs Farm, in Kaipara Harbour, north of Auckland, commissioning works by artists such as Len Lye and Andy Goldsworthy. The Scottish collector David Roberts is closing his gallery in London this autumn and plans to open a publicly accessible eight-hectare sculpture park in Somerset, western England (pending approval from the local council). Geoffrey Edwards, a former curator of sculpture and glass at the National Gallery of Victoria in Melbourne, is advising on the hugely ambitious Point Leo project; it is a first for Australia, he says, because the country’s larger sculpture gardens and parks are almost all associated with public institutions. “No one has gone about creating a 1arge-scale sculpture park from scratch, and certainly not on the basis of a carefully thought-through vision and business plan, as at Point Leo, involving a professional curatorial adviser and a noted landscape architect to devise a layout of paths, copses, lawns and discreet enclosures.” Edwards says. The curator has relished installing works in this “quintessential Australian landscape setting, with rolling grassland receding into the distance, existing conifer windbreaks and broad vistas to Western Port Bay and beyond”. Tony Cragg’s work Luke (2008) stands in a sunken, amphitheatre-like space in the landscape, and pieces by the late Japanese-Australian sculptor Akio Makigawa will also nestle among the contours. Commissions, few in number but major in scale, will take shape over the next two years he says. stainless steel form, titled Rise 1, and a 3m-high bronze called Folded. His expansive, audacious work has found favour among patrons who look to him for show-stopping land art. “Alan (Gibbs) made the effort to travel to Cappadocia, Turkey, to view my land art park; walking around the 13 structures and the 19m-high basalt columns triggered the realisation of Sentinels (2017),” he says. The four-column piece creates and eye-watering silhouette as the sun rises over the undulating vistas of Gibbs Farm. Guy Laliberte, the co-founder of Cirque du Soleil, is another Rogers devotee. Laliberte arrives at his retreat on Ibiza’s west coast in his boat. Walking towards his cliffside estate, he passes a monolithic, Stonehenge-like installation that dominates, the dusty, sun-baked landscape. The work, named Time and Space-the Speed of Light, is by Rogers. 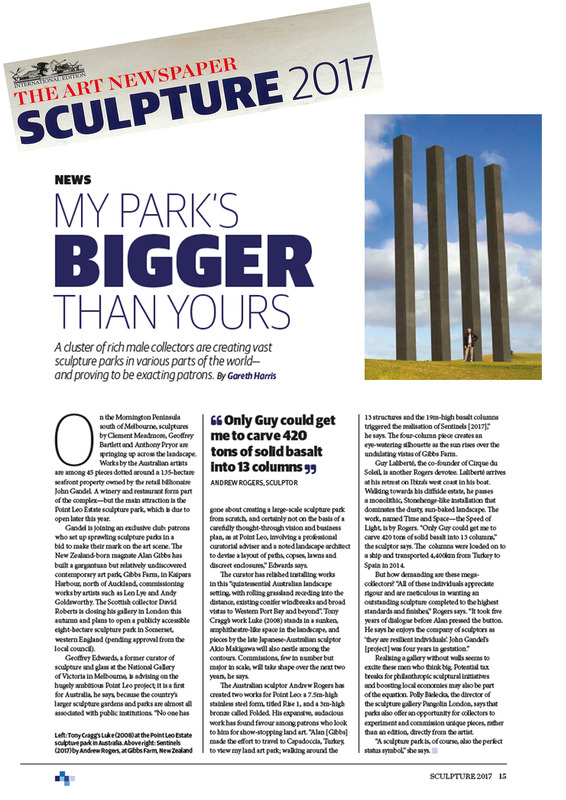 ·”Only Guy could get me to carve 420 tons of solid basalt into 13 columns,” the sculptor says The columns were loaded on to a ship and transported 4,400km from Turkey to Spain in 2014. Realising a gallery without walls seems to excite these men who think big. Potential tax breaks for philanthropic sculptural initiatives and boosting local economies may also be part of the equation. Polly Bielecka, the director of the sculpture gallery Pangolin London, says that parks also offer an opportunity for collectors to experiment and commission unique pieces rather than an edition, directly from the artist. “A sculpture park is, of course, also the perfect status symbol,” she says.